She paints in oil using traditional methods. She specializes in portraits where the clothing is a work of art. She is well known for painting fabric folds, ruffles and lace. Creating portraits that will live on through generations. I grew up in the village of Dunoon on the river Clyde at the edge of the Scottish Highlands. Capturing a slice of time for the future is just who we are, whether it is the rock carvings of the Picts, Rabbie Burns poems or paintings by Ramsay and Raeburn. We need to fashion something survivable in the torrent of time as all of us who know anything about a subject fade away. I want people to see a life and give it meaning or ask about the soul that is now a vestige. I guess I am creating ghost. Having lost a child of my own I wonder if that plays into my desire to commit people to oil at a good time in their life and in a beauty. I feel it is important to capture the individual in a meaningful setting to reinforce a memory for those who know them. I have chosen to do this in a classical way that may be cherished. If factual memory fails, it may be appreciated by others simply for its beauty and imagined familiarity. I try to capture the essence of the person for the intended audience and to leave enough clues for creative minds to manufacture a familiar character of their own. I will never meet Bouguereaus’ young shepherdess or anyone who knew her but she has an identity in my heart. I want that. For more information and pricing please email me. "Alison painted a portrait of our granddaughter Lily. We wanted her sitting at the top of our stairs. We liked her expression in one picture and her pose in another picture. She combined the two and used the expression we wanted. 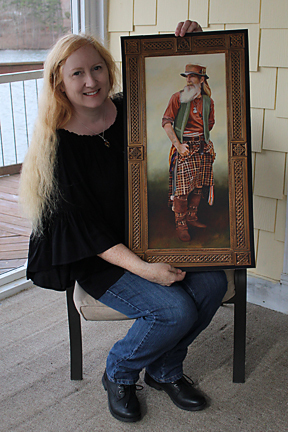 It is a family treasure and we could not have been more pleased with the portrait or with the patience of Alison. We highly recommend her. " "Alison painted a picture for us of our boy/girl twins. She captured their everyday personality, perfectly. She is one of the most patient, kind and talented women that I know and I am very honored to have one of her pieces of art. It will always be one of our greatest treasures. Thank You Alison." "I can not say enough about how HAPPY and EXCITED I am with the portrait of my grand daughter, Emma Reese, that Alison delivered today! SHE IS GORGEOUS and so life-like! It is as if I can touch the azaleas!! I was so pleased with the entire experience of working with Alison! She is so calm, reassuring and Talented!!! Emma Reese LOVED the photo sessions with Alison, and I can not wait until she sees herself on canvas tomorrow!!! She will be forever young in my portrait!!! Thank you Alison for sharing your talent for us to enjoy!!" Prints available of many of my paintings. Email me for size & pricing.